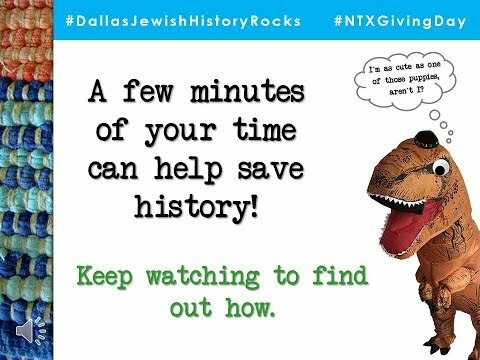 Dallas Jewish Historical Society collects and preserves documents, photographs, and artifacts that illustrate the history of the Jewish community in Dallas. We keep the past alive through innovative programming, community outreach, and through collections accessible to our patrons and researchers. Our archive includes documents, maps, photos, artwork, objects, textiles, and an extensive oral history collection. We host a Lecture Series, an Oral History Program, Bus Tours, and other events. Dallas Jewish Historical Society tells the story of Jewish Dallas and in doing so, tells the story of Dallas itself. Through our collections, artifacts, and programming, we not only tell the cultural history of Dallas, but also partner with other cultural and educational organizations to flesh out the story of how, through its various populations, Dallas became the city it is today. We reach out to both researchers and family members looking to explore local history and through our annual lecture series explore topics of interest to a variety of participants, including those interested in history and genealogy and cultural arts.